After performing the preprocessing steps explained in the previous section, we obtain multispectral data G e IR(mx,my,l,n) consisting of n correctly aligned, normalized data sets, where extracerebral voxels are excluded by a presegmentation mask. This can be interpreted as follows. 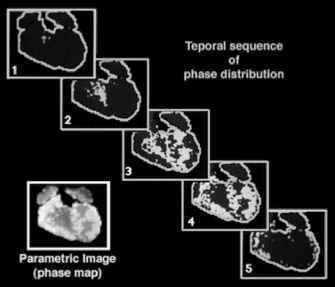 FIGURE 7 Segmentation. 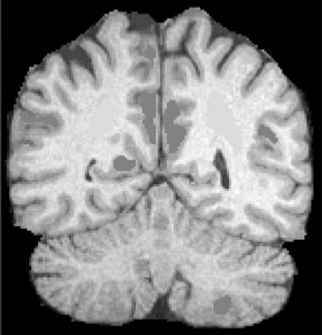 (a) T1 weighted image of a 3D data set. 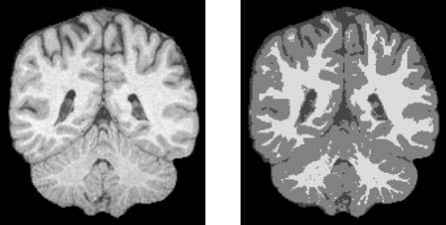 (b) Corresponding segmented image with gray-level representation of the tissue classes (medium gray = "gray matter," light gray = "white matter," dark gray = "CSF"). FIGURE 8 Manual labeling of tissue classes for supervised learning. The labeled regions (medium gray = "gray matter,'' light gray = "white matter,'' dark gray = "CSF") provide the training data set for supervised learning of the output weights Sj of the GRBF network.